Who wants to talk about incontinence? The subject is one that causes extreme embarrassment for many, and is not a topic that many want bandied about among friends, family or peers. However, understanding incontinence and the types of products available that can help increase your quality of life, reduce embarrassment, and improve or maintain your self-esteem and dignity is worth discussing. Urinary incontinence is defined as a loss or weakening of bladder control. Urinary incontinence occurs in both men and women, and sometimes prompts leaking or a sudden, small gush of urine when sneezing, coughing or laughing. At other times, a weak bladder may force you to stop what you're doing because you have an unstoppable urge to rush to the toilet to avoid an accident. If you or your parent has noticed a difference in their bathroom habits, or sudden loss of bladder control is affecting your life on a day-to-day basis, you are urged to visit your doctor. In some cases, incontinence may improve with medical treatment, medication changes, and changes in lifestyle as well as some type of bladder training program. Irritated bladder - for some seniors, certain types of foods such as those with artificial sweeteners, spices, or acids often irritate the bladder. Talk to your doctor about treatments or changes in diet. Your doctor may also suggest bladder-training exercises that will help strengthen the urethra and control leakage and lack of bladder control. In the meantime, check out a number of incontinence products that may help you maintain your daily enjoyments and activities, reduce embarrassment, and keep you more comfortable. 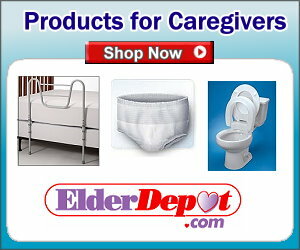 Incontinence products may be purchased from your local drug store, from medical supply stores, and over the Internet. When ordering incontinence products through the mail, you will be comforted to know that the whole world isn't going to know what's inside the box. Incontinence products delivered through the mail most often arrive in plain brown packages, maintaining your dignity and reducing embarrassment. The most common products and supplies include adult briefs, which help to catch urine. Worn under clothing, today's briefs are designed for maximum absorbency without the bulk and noise of older protective products. Briefs come in a variety of styles and absorbency and attach front to back with sticky tabs or hook-and-loop closures that enable a customized fit. Many brands can be worn all day. Some don't require tearing or disposal of a brief worn for protection, even when you're able to get to the bathroom in time. Briefs are also available in latex-free design and construction for those sensitive or allergic to latex. Another very common product is under pads or bed pads that help protect bedding and furniture. These very thin pads are coated with plastic on one side and super-absorbent padding on the other. Thin and disposable, some models and brands are washable and reusable. Others are to be disposed of after use. When used on beds, the under pad or bed pad may be placed between the individual and the sheet, while others may prefer to slide the padding beneath the sheet and the mattress. Under pads and bed pads also come in a variety of styles and sizes. Most incontinence products are available in unscented varieties that kill germs, help prevent spread of bacteria and offer superlative cleansing and skin moisturizing when used. Don't let incontinence or embarrassment caused by sudden leaks spoil your quality of life. Talk to your doctor about incontinence treatments and therapies and research the myriad of products on the market today that will help you maintain an active and healthy lifestyle.